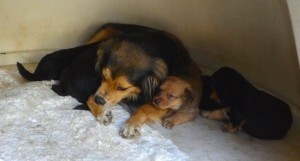 We heard about a mom with her five puppies on the street and made arrangement to pick them up. Dolly, the mom, is a sweet girl and is amazing mother taking care of her 5 puppies even though they were homeless and abandoned on the street with no food or love. We brought Dolly and her babies into our facility and immediately went to work feeding them and running tests. In addition Dolly and her babies were covered with fleas and ticks, the ticks were complexly engorged with blood and we began the pain staking job of removing them. We began running tests and discovered that Dolly unfortunately also had Cancer. In addition the Cancer, Dolly has several other infections related to being covered in so many ticks and being on the street homeless. Dolly has ehrlichia, anemia, several bacterial infections, high white blood cell count and demodectic mange. Dolly’s babies were also very weakened by the ticks and fleas and being homeless on the street and have anemia, bacterial infections and demodectic mange from the stress of living on the street. This sweet family needs your help to make it. It is not their fault. Though no one loved them and left them to die on the street they survived. They are fighters and stayed together against impossible odds. Dolly will need extensive treatment with chemotherapy for at least seven weeks and she will require multiple treatments of antibiotics, cortisol steroids, iron dextran, thiamine, pyridoxal and a possible blood transfusion. The babies will need antibiotics and be closely monitored each day. We want to save this family! We have the know-how we just need the medicine to do it. Please help us save this family that fought so hard and finally have made it off the street so they can become healthy and find loving, happy homes once all better. Please donate to save them today. Without these treatments, they may not make it. Dolly’s babies have been given a clean bill of health and have all their shots and have all been adopted out to loving homes. We were getting ready to adopt Dolly but her cancer has returned. We will be giving her another round of Chemotherapy to hope that this time it goes into remission for good.